Every guitar has a story. My wife had given me a Fender baseball hat for Christmas. For the record, for work and church, I wear a fedora (why get old if you don’t get a hat out of the deal?). When I’m just me, I wear jeans, polo or tee shirts and ball caps. Back to the Fender cap. My lovely wife had taken my Peavey six-string acoustic to a proper luthier who told her that there was only so much you could do when a guitar aged, and it would never sound like it did in its prime. (Sigh). Soon, another birthday was looming (how quickly they pop up anymore), and in light of the prognosis for the Peavey, my wife suggested (after I begged, whined, and otherwise debased myself) that maybe I should pick out a guitar for my birthday. Now, you have to realize that when my family visited my brother-in-law’s family, or his family visited us, Bill and I would drag out the guitars. He was a huge Taylor fan (the guitar, I’m not sure about his opinion of James Taylor or Taylor Swift). The first time we did, he pointed out that although the guitar had been untouched for over a year, it was still in tune. I was impressed. In any case, I thoroughly enjoyed my guitar encounters with Bill. When I got to Guitar Center, I picked up Fender after Fender, but none really fit me. It’s kind of like when I was still able to jog and Nike was the cool brand, but it didn’t fit my foot. The store clerks suggested various brands that I had never heard of. No luck there, either. Now, to put things in perspective, I was not willing to pay as much for a guitar as my first (EXTREMELY modest) house cost. That is the price range for the good guitars. I knew I was going to spend several times what I had ever spent on a guitar before, but that was just above the best of the bargain guitars and just barely at the cheapest of the good guitars. At the time, I was playing guitar at Sunday Mass, and realizing my limitations, was happy to go with an acoustic, so my errors and shortfalls were obvious only to God and myself. I figured that God looked at me as parents look at their kids at a recital or concert and ignored any missed notes. The Taylor guitars began to call me. I tried several modes Taylors that were priced in my range. I then tried equivalent guitars from other brands. Then I tried the Taylor again. I could continue, but you’ve probably already figured out how things ended. I took home a Taylor 110. 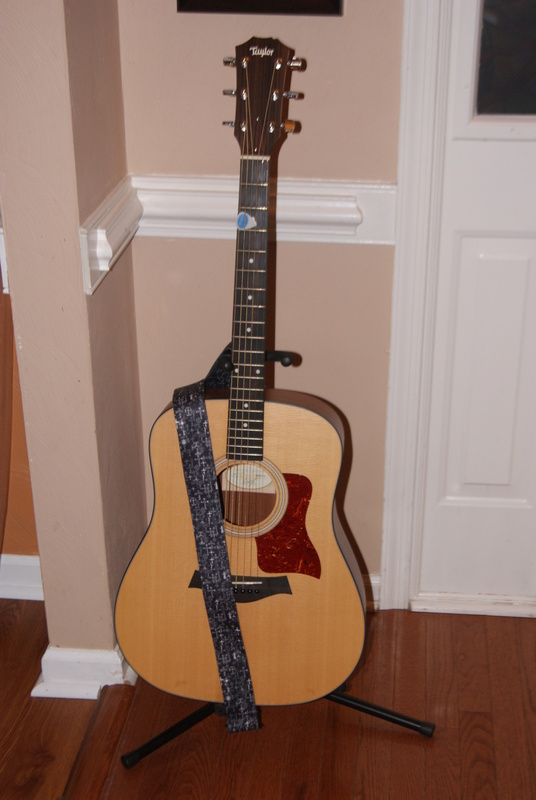 I added a guitar strap that was black with white crosses—perfect for church—but then my wife pointed out that it also had coffins and headstones. I never suspected that I was secretly goth. It just goes to show you. I hope you enjoyed this series. Now I have to figure out what I’m going to write about next! My wife pointed out that I’ve been writing this blog for ten years. Wow! Hard to believe. I hope I won’t run out of ideas! I confess, I often act under the delusion that if I get a certain type of guitar, talent will somehow rub off on me. It’s kind of like Arthur pulling the sword from the stone—KAPOW! He’s king! Therefore, if I pull a certain guitar from its packing crate—KAPOW! I’ll be an awesome musician! Alas, it doesn’t work that way (dammit!). 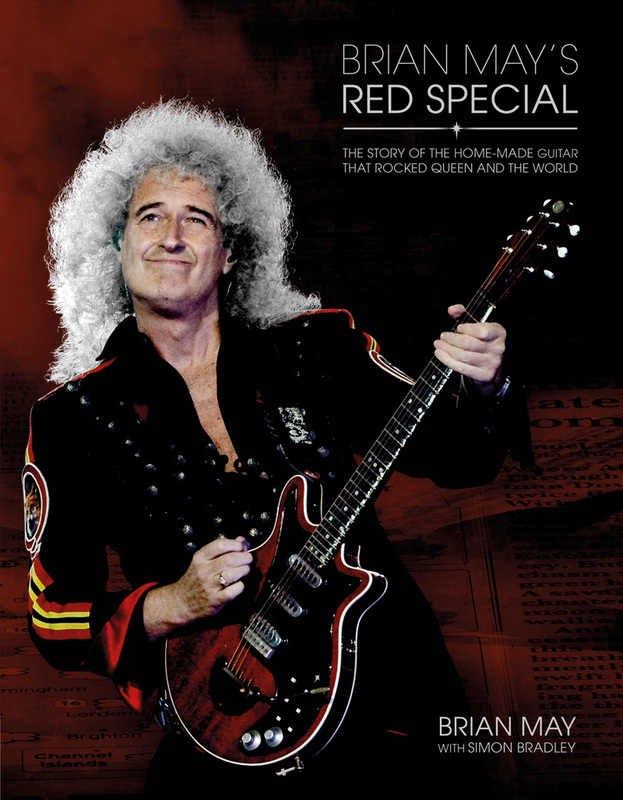 Having always enjoyed Queen, I was lusting over a reproduction of Brian May’s “Big Red” guitar. 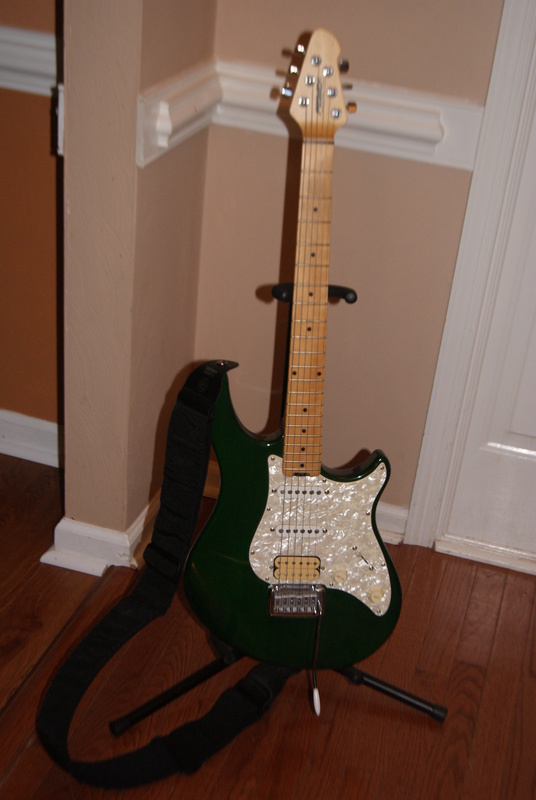 Brian (Dr. May to you astrophysicists) designed his guitar and with his father, built it. The body was cut from an old (and in England, old means something different than it does here) mantel piece. He apparently designed and built the pickups himself. The best part—at least to those of us who are geeks who love music—is that there are three pickups and six slide switches. With most multi-pickup guitars, there is a single switch that lets you choose each pickup, or a combination, thereof. In other words, they are added together. Brian designed his so that he could either add any pickups OR put any one out of phase so that one is subtracting tones from the other(s). I cannot tell you how cool I find that. However, I couldn’t justify it at nearly a thousand, once you add a case (Sigh). Fathers’ Day arrived one year, and my wife took me to Guitar Center so I could choose a gift. I was worse than she is in the handbag department; I tried this guitar, that guitar, another, etc., ad nauseum. I told them that I wasn’t a soloist; I was a rhythm player (at best). However, I did like that “spooky” sound from Big Red. 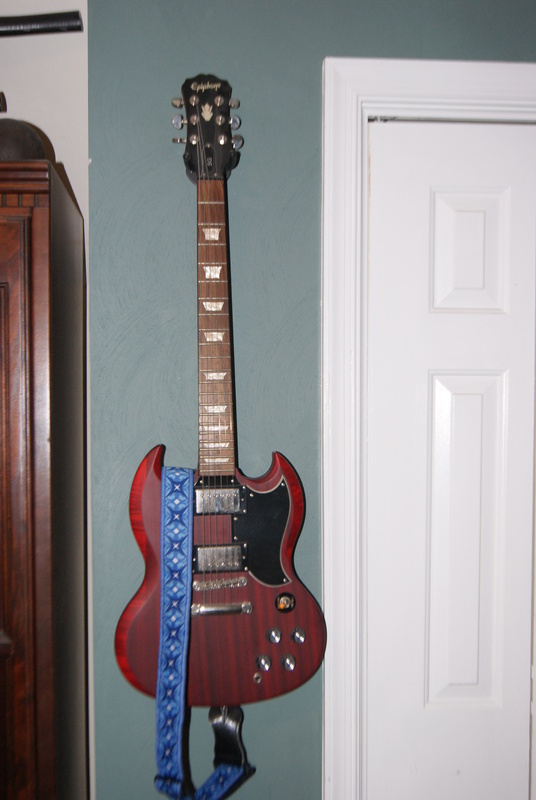 The guitar I kept coming back to was an Epiphone SG. The luthier at the shop, noting my comments, mentioned that if I wanted that sound on the SG, all I needed to do was reverse the polarity on one of the pickups. Being electronically inclined, I knew I could do it, so the SG was duly adopted and brought home. I did reverse the polarity on one pickup, but within a couple of weeks, I had rewired everything back to normal. Sorry, I’m no Brian May; I play rhythm. However, the SG is a great guitar to play. Mine’s solid body, unvarnished red. I’ll leave Brian May to handle Big Red, I’ll play rhythm, thank you. P.S. Speaking of Queen, if you bump into John Deacon, ask him if he ever did anything further with electronics (his major at university). Being a geek, I often wonder about that. I’m skipping out of chronological order so I can save two of my four favorites for last. You’ve already read about my green Peavey Predator Plus and the Peavey Briarwood 12 string, my other favorites. 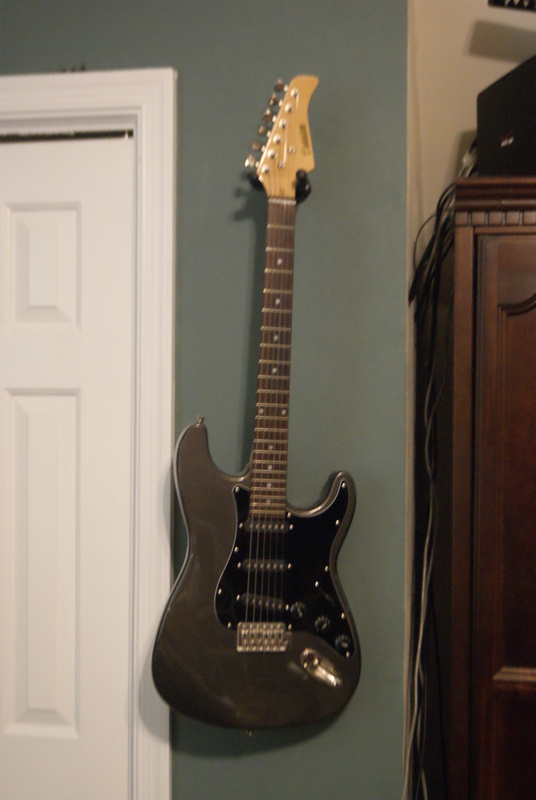 I bought a used Deltatone, a relatively inexpensive electric guitar, which plays surprisingly well. I had looked on Craigslist for a bargain because I wanted a “travel” electric that might get banged up a little without making me feel too bad, and the Deltatone did a fine job. My two youngest have long played soccer, and until they began to drive, my wife and I shared chauffeuring duty. Mind you, I didn’t say we shared equally, but I’ll leave it up to you to figure out which soccer mom took the lioness’s share. We had a minivan at the time, so there would usually be a number of soccer girls who rode along. When it was my turn to drive, after we got to the pitch (for non-soccer types, the playing field) I waited until they were far enough away so that I didn’t humiliate my daughter. I’d retrieve the Deltatone, sheet music, and a battery-operated amplifier from behind the rear seat and sit in the back seat, practicing. I don’t know if it helped make me a better musician, but it was the best way to utilize an hour and a half of time to myself. I’d work on whichever songs I was interested in, and when the weather was pleasant, I’d slide open the side door. Every once in a while, another soccer parent would park next to me before I could close the door. I think the expression they gave me was bemusement, but it might have been something less flattering. And, before you ask, I tend not to sing when I play, especially when I’m not safe within my own four walls. I identify with Ringo Starr, when he was with the Beatles; I have a five-note range. Even worse, when it comes to singing, those notes are never in the key of anything I’ve learned to play—not that I am able to stick to one key for more than two measures. My singing voice is kind of a B—sharp(ish) without being a C, if you know what I mean. Since the kids have outgrown the need for chauffeurs, the Deltatone doesn’t get much attention any more. I’ll soon be trying to find a new home for it via Craigslist. Maybe it’ll be the first axe for a future star. Today’s other guitar is “Custom Made by Harmony,” which I found it in a thrift store. Now, in all honesty, many thrift store items are priced at, or nearly at, the price for the same item new. This guitar was an offer I couldn’t refuse. 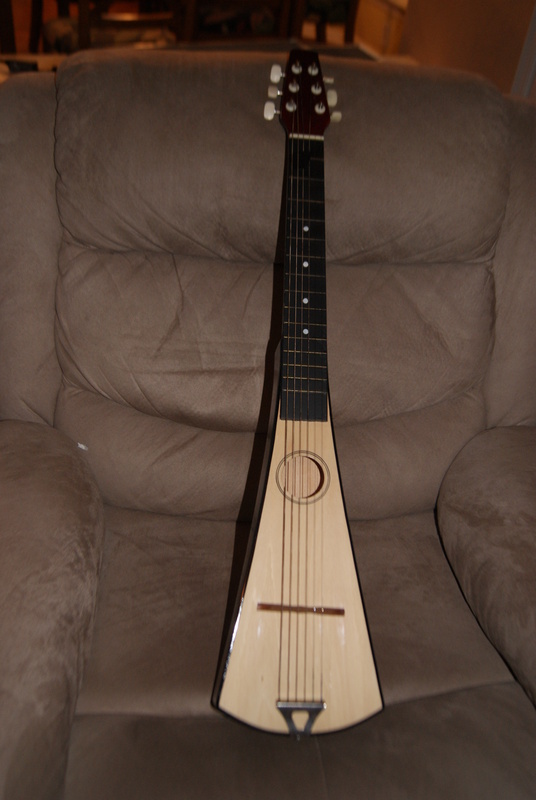 Besides, all of my other guitars are steel string, while this one uses nylon strings, which are better for finger-picking. Unfortunately, I have numbness in a few of my fingers and haven’t finger-picked since my Hawaiian guitar days in elementary school, but I still hold out hope. I did briefly own a Squier by Fender bass guitar within the past year or so. I love the bass riffs from the Beatles, the Moody Blues, and Fleetwood Mac, but as the saying goes, “So many guitars, so little time.” It deserved better, so it’s now with another aspiring musician. As you can see, I keep some of my guitars on the wall. I believe this is important. If some Hall of Fame musician breaks into my house in the middle of the night and wants to jam, I’m ready to grab a guitar for each of us and go at it. Hey, statistically it’s more probable than winning the lottery. If it does happen, I hope they don’t expect me to sing. I do not have a “solo” picture of the next guitar that adopted me, because a few years ago, one of my co-workers was looking for a decent guitar. Somehow, we came to a deal that pleased us both (and lest you think I took advantage of him, he’s frugal to a fault, and describes himself as ADHD, obsessive-compulsive, and Aspberger’s syndrome; all probably true, but he’s a great guy and you just gotta love people like that). At this point, he’s probably far outpaced me on playing, but that’s better for the guitar). We were still over in the desert. Emboldened by our Christmas concert, the USO coordinators, apparently desperate for entertainment, asked us (or maybe Rubin begged them) to do another performance around Valentine’s Day. I was on a roll, and since I knew that if I ordered a new guitar, the shipping line would say, “Thank you for you service,” I found a black Epiphone electric—complete with case. I got online, grabbed my credit card, and lo, another miracle occurred. The Epiphone Limited Edition Les Paul Special Electric Guitar was a pretty decent guitar for being modestly ($150) priced. They still sell the same guitar today, so obviously, there’s something good about it if it still sells for the same price 12 years later. I loved it, and thought that the guitar would magically make me a better musician. However, there were two other guitarists in the group (not counting the bassist) who were far more talented than I. I’m not talking, “You’re good—he’s better.” I’m talking, “Stick with the acoustic, Nowak, and back away from the microphone, please.” Nevertheless, we had a great time playing typical garage-band covers from the Beatles, the Eagles, and other influential musicians from my youth. Unfortunately, that was my last time playing rock and roll with anyone. I miss it, but since I get up for work before 5:00 AM, staying up past 8:00 PM is just not in the cards. 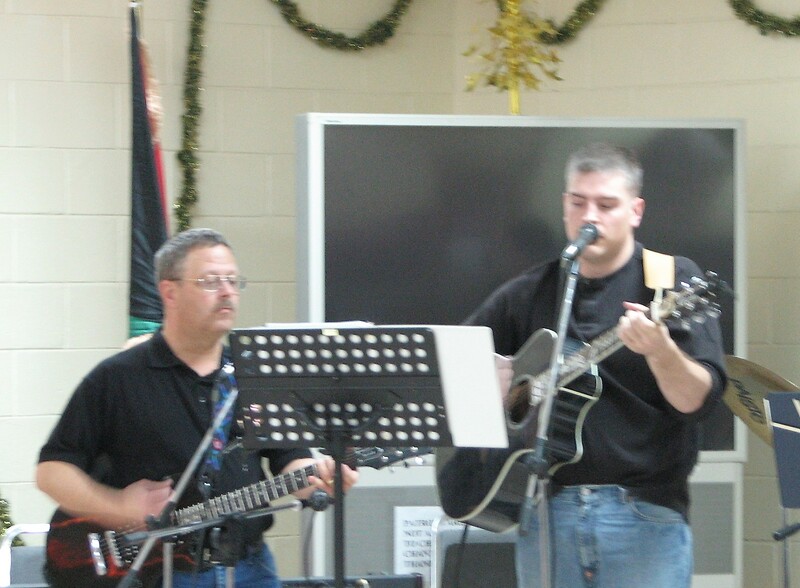 So, here’s the only picture I have of that particular Epiphone–our Valentine’s Day concert at Camp Arifjan, Kuwait. I’m the short intense looking dude (never could remember lyrics) on the left. However, as you will see in a forthcoming episode, the reason I was willing to part with it was because my wife orchestrated my getting another Epiphone as a Fathers’ Day gift. It was a few years, a marriage, a move or so, and a son and a daughter later before I got my next guitar. We were living in Cheyenne, Wyoming—a wonderful place, although you do have to get used to the wind—the Wyoming Wind Festival runs from 1 January through 31 December—and they sell the tee shirts to prove it. In other words, when you first move there, the first priority is to figure out how to bungee cord the lid to the garbage can. Cheyenne was small—about 53,000 people (in a state with 500,000, or 5 people per square mile) so it was a bit modest as far as shopping opportunities. For example, the first year we were there, the newspaper declared Sbarro’s Pizza as second place, in the “Best Restaurant for Lunch” category. We’d regularly go to Fort Collins, Colorado for “real” shopping, but there were definitely places in Cheyenne worth visiting. One day my wife wanted to go to a craft store. I think I went in, and “finished” much earlier than she did, so I decided to go next door. The music store had guitars on sale—the previous year’s Peavey Predator Plus. They had two, both green. Apparently was not fashionable (aka “cool”) and therefore, not a big seller. The guitars were marked down to half price or so. (Not actively shopping for guitars, I can’t say if it truly was a great price, or if they merely boosted the “original” price. Nevertheless, at the time, it seemed like a great deal.) I picked one up and I loved the feel; I mean, it was like, “Even I could play this!” I was hooked. The Predator series is supposedly inspired by Eddie van Halen, with a shorter neck to allow people with talent (like him) to move more quickly around the fretboard; it also allowed short under talented guys like me to feel cool, which is pretty awesome in itself. I mean, think about it. Playing a guitar, roughly the same color as my 1972 Ford Pinto could make me feel cool. How weird is that? Cool guitar. Wife supportive. Parents paying. So, who cares if it’s green? I used to download chord charts and play rhythm along with Eagles CDs. Fortunately, none of the Eagles ever found out. Don Henley would have been most unhappy. Timothy B. Schmitt and maybe Don Felder might have even been willing to play along with me, so long as no one told Glenn Frye or Don Henley. However, if Glenn and Don found out, even though Joe Walsh and I have a lot in common (ham radio, northeast Ohio, etc.) I don’t think he would have dared to rush to my defense. Nevertheless, I had fun. So, 15 or so years later, the green Peavey Predator Plus is still one of my favorites. The machine head has a locking system to keep the strings in tune. It’s got great pickups that can be switched in and out. That short neck does work well for me, and I have to admit, I’ve never thought—even once—of having it painted. Incidentally, we returned to that same music store just before I deployed to buy a piano for the kids to start their music education. We still have the Peavey and the piano. People describe their lives using various benchmarks. I’ve decided that the best way to describe my life is in terms of the guitars I’ve owned and played. Now remember, I am of limited talent when it comes to playing, but unlimited enthusiasm and enjoyment when it comes to guitars. Alas, I have no pictures of my first guitar. Back in grade school, I told my parents that I wanted to take guitar lessons, so they went to the music store around the corner. The teacher said that I was too small to play standard guitar, so I needed to learn Hawaiian guitar. My father found a used electric, and to keep it from sliding off my lap we cut up one of my grandfather’s old fedoras and glued the felt to the back. After a couple of years, I lost interest (a typical childhood reaction to any music lessons) and I’m sure that guitar ended up in the local classified ads. A few years later, while still in grade school, I used the money I had earned by mowing lawns and shoveling show ($1.00 per job was the going rate back then) and ordered, by mail, a Sears Silvertone guitar. I tried, unsuccessfully, to teach myself. Apparently, Silvertones of that time period did not have a metal truss in the neck, so according to “the experts” the neck eventually warped until it folded the guitar in half. I neither recall that happening to mine nor whatever happened to it; I probably traded it for a radio. During high school I learned clarinet, then played tenor saxophone in marching band and bassoon in concert band. However, at least I now had some music training ang theory to draw on. When my first, last, and only book was published, I used the proceeds to buy a blonde Squier by Fender electric. I lived in Northern Ohio at the time, and most of my hobby material was in the basement. Apparently, the basement was cold enough that the finish cracked—not the guitar, merely the finish. During a move several years later, I decided that it belonged in the garage sale, not the move. Movers charge by weight for a reason; if you’re doing the move yourself, you can fully appreciate their position. Advil and liniment can represent a significant expense. Now, skipping ahead about five years, after moving to Louisiana, I used to get catalogs from a company called Damark that sold closeouts and overstocked items. 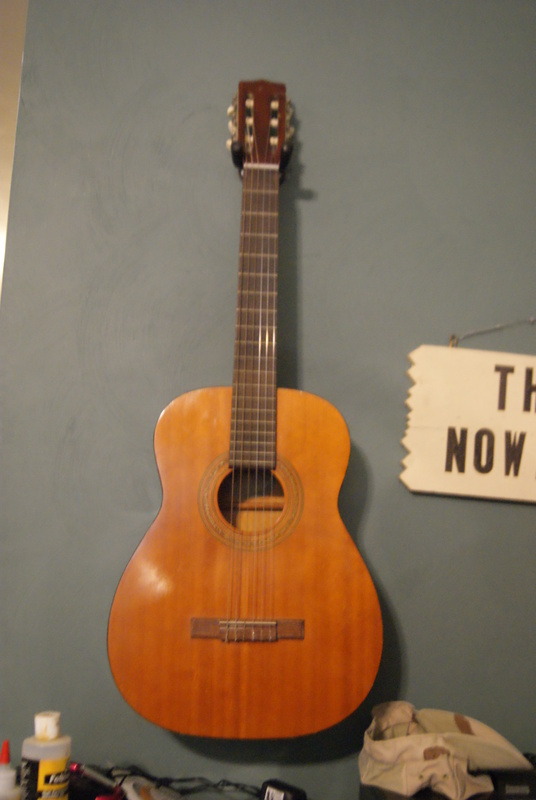 I purchased an Eterna-by Yamaha six-string acoustic guitar from them. The price was right (I think) and it played okay, although nothing to write home about—although this is the first guitar that I do have a picture of. 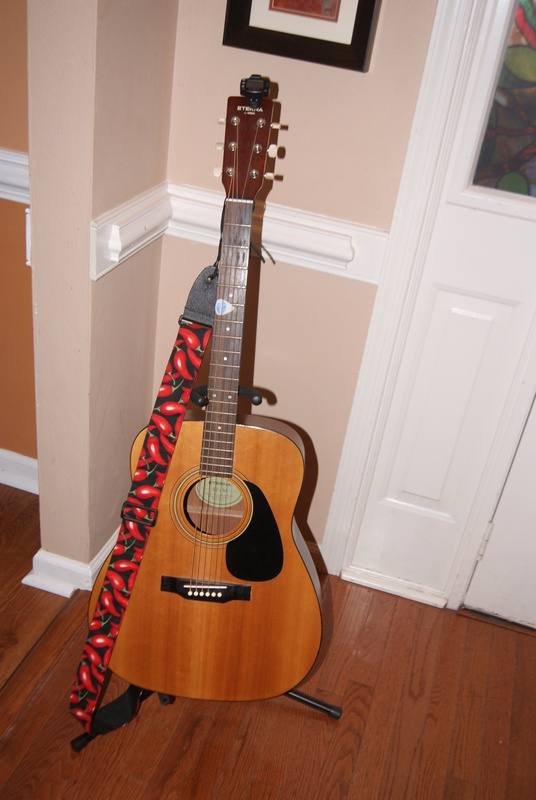 In the Louisiana spirit, I picked out a guitar strap with chili peppers on it. I still play that guitar and use it as the guitar I take outside to plink on while I have food on the grill. It’s good enough to play, and humble enough to accompany me when I cook. Besides the chili pepper guitar strap, you may notice an electronic tuner on the headstock (I love those things!) and a Cool® guitar pick. I lack feeling in some of my fingers, and these picks have a sandpapery feel where the blue is, so I don’t lose my grip on them. 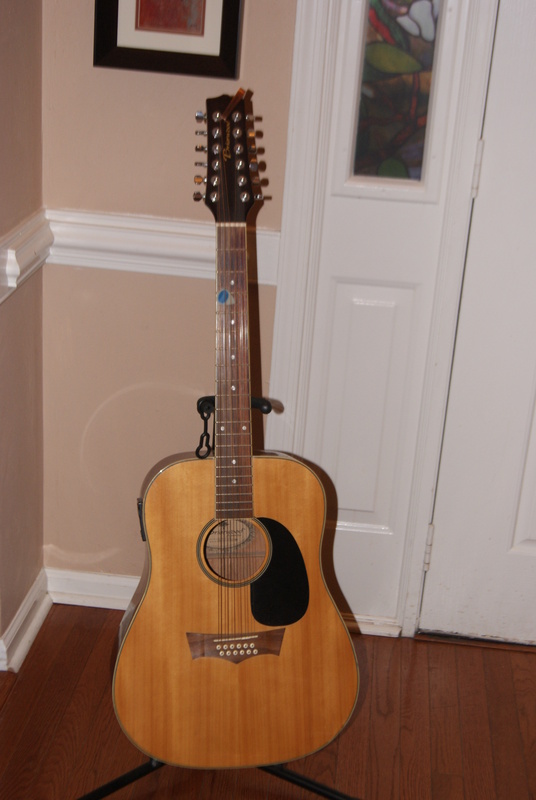 The Yamaha Eterna was the one and only guitar for nearly ten years, after which I began to run amuck. Over the years, I have sworn off various things. Actually, it was more of a worn off than sworn off. Television programs lost quality, although there was a vast increase in quantity thanks(?) to cable. Too many choices, not have enough time to actually follow a series, so now it’s the occasional Netflix. I do watch the morning news for the weather forecast and traffic report. Unfortunately it seems to be 80 percent commercials, so I have to pay strict attention while shaving or else I miss it. I used to love computers, which led to a fascination with the internet. Most of what is available online is best left alone. Let’s just say that it’s a bit worse than a naked stroll through a tick infested patch of poison ivy complete with brown recluse spiders and venomous snakes. I admit that I deny reality and look for decent content. Unfortunately, the best I find are things like YouTube videos showing me how to adjust the carburetor on my weed eater. So, what does that leave? Reading, writing, experimenting, ham radio, guitar, drums, or puttering around the house. All things considered, much better choices. Writers of fiction need to be a bit schizophrenic; they live partially in this world and partially in the world that doesn’t exist except as printed words. It’s the characters that are to blame. As I’ve mentioned before, when I’m writing, if I know my character—and for clarity’s sake, let’s stick to just a single character—when that character is placed in a certain situation, it’s easy to write, because I know what that character would do. I can even anticipate when that character is going to do the opposite of what would it would normally do. As a writer I unconsciously develop the character’s back story. In the story I’m working on now, I’ve got a pretty good understanding of what the protagonist’s life has been like up till now. I may not have thought through details, but since I have the overview, the events that led to a particular trait reveal themselves fairly easily when I need them. I wrote one column for nearly twenty years, and I knew one character intimately. On the other hand, these stories included a narrator—think Dr. Watson to Sherlock Holmes. The difference was that I never really knew who this narrator was. Was it me? Was the narrator male? Female? Caucasian? Ethnic? To this day, almost 33 years after I first began to write that story, I can’t tell you. Why? I don’t know. Perhaps it encouraged everyone to identify with the narrator. It might have been that as a character, the narrator was merely a mechanism—like the plucky comic relief character in a movie. The narrator might have been the human version of Alfred Hitchcock’s McGuffin. Hitchcock explained that a McGuffin was something like the microfilm that all the characters tried to get; what is on the microfilm is unimportant. For that matter, the narrator back then might even have been named McGuffin. Who knows? I often wish that my blogs would lend themselves to more pictures. I’m not a bad photographer, and some blogs are full of sunsets, beach scenes, Grand Lake up in the Rockies, or whatever. Mine—not so much. I’ve been going through some physical therapy for some old injuries. The therapy has actually worked better than a variety of drugs that have been prescribed in the past. However, for it to work, I need to be consistent in my follow through. It struck me, that if there’s a common theme in life, that’s it. When John Lennon died, it was a senseless shooting. It was shocking, but it really didn’t affect me personally. Freddie Mercury died of AIDS, which was pretty much a death sentence back in the early 90s. No one was surprised, given that Freddie Mercury was—Freddy Mercury. Dan Peek from America died; I love their music, but have no idea what he even looked like. David Bowie—I wasn’t a huge fan, but he was a little too close to my age when he died. But Glenn Frey? That hits too close to home. I love listening to the Eagles, and have been known to play along with their CDs. My wife and I saw the Eagles perform, and thoroughly enjoyed it. I suspect he was a bit—shall we say—headstrong? Don Felder would probably agree with that. As Joe Walsh said, “It’s Don and Glenn’s band.” It won’t be the same, even if they try to keep things going. It’s yin without yang or heads without tails. Plus it reminds many of us that no one lives forever. But I will always enjoy Glenn’s music, and am glad that he left it behind for us to remember him by. My son, daughter-in-law, and grandchildren drove 12 hours to visit. My daughter, who has started reading my blog, says all my blogs are the same. I keep coming up with ideas that are incomplete—which got me thinking. My New Year’s resolutions. After “I will never be a staffer for Donald Trump,” I got stuck. I tried to write about the era of Downton Abbey and how people were once born into wealth and/or married into it, and how that is rare today. I should not get mad so soon. Let me close this year with my thanks to God for my NORMAL family (the emphasis is there to remind me that despite the condition of their bedrooms and bathroom, my kids are normal; on the other hand, given their outstanding academic, athletic, and musical accomplishments, I owe it to them to differentiate between normal and average). For you, may 2015 be the year that was just before when everything became wonderful. My daughter played in a symphonic concert this weekend, and I was the designated (volunteer) photographer. I used to do a lot of photography in my younger days and still remember a thing or two. Of course that pales in comparison to what I’ve forgotten (e.g. if you own multiple digital cameras, put different lenses on them rather than trying to juggle two lenses at the same time). Taking the pictures is the easier part, and while darkrooms are rare, many of the darkroom techniques have migrated to computer. So, when I got home, I sorted the photos. I then dodged and burned images, adjusted framing just like the old days, but without getting my hands wet. I’ve gotten used to this by taking the pictures at my kids’ soccer games. However, I began to think (always dangerous) that while sports photos are an American tradition requirement, photos of a concert are a bit different. 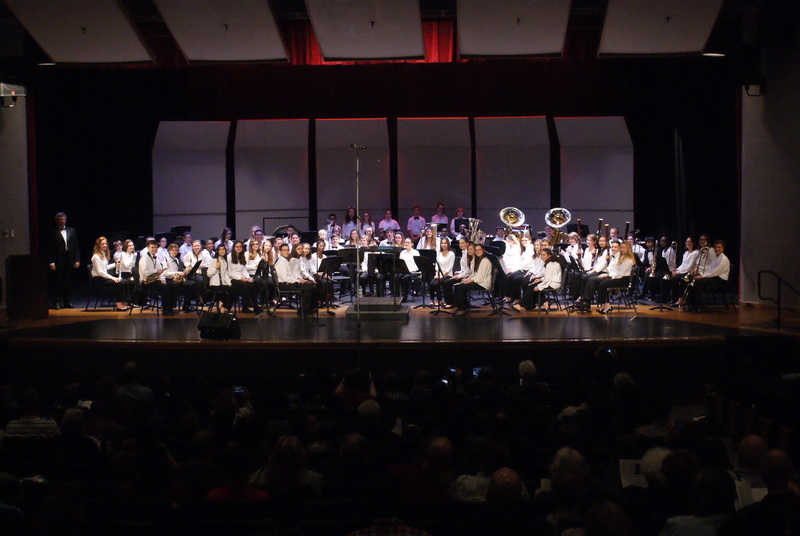 So, my photos may not transmit, explain, or even reflect the melody, the harmony, the counterpoint, or even the thematic chords that were performed, but it does give the parents a chance to see their kids on stage. * Although my son wrote his college entrance essay on soccer and its comparison to international relations. My priorities never seem to be in the order I wish they were. I’m dying to get in some guitar and drum time, and after readjusting my ham radio station, I want to get on the air. Unfortunately, we had a bit of a plumbing disaster, with the need to cut a hole in the wall. Naturally, the hole needed to be cut right next to my radio gear. I need to finish patching the hole—which is progressing nicely, thank you—which creates large amounts of dust. I have a number of painting tarps, but I don’t want that much weight on my gear, so I need to get a couple of cheap plastic ones. Once the hole is patched, sanded, primed, and painted, then I can……….put all of the shelves back and all of the office supplies, etc. back on the shelves. After dusting, vacuuming, and replacing all of the air purifier filters in the room (theoretically to keep regular and kitty litter dust under control), then I just may have time to play. If I’m not too tired, maybe something inspired by one of my favorite groups (with apologies to the Beatles). I’m fixing a hole where the plumbing was broke, Which keeps my hands from playing, My guitar. I’m priming the crack that is now plastered up, Which keeps my hands from playing, My guitar. Oh, it really doesn’t matter if I prime it right, Or if I paint it right, No one will know. A great big shelf will hide it all,None of this work will show at all. No one will know. I could continue, but I’ll spare you the insult. Alas, another birthday has come and gone. Gone are the days when I felt smart and confident. I no longer have all the answers—I have teenagers, instead, and no one is better at reminding me how little I know than my kids. Apparently I have more in common with Forrest Gump than Albert Einstein. Of course, Phil Collins, “Land of Confusion” says it all. Now hand me my inhaler so I can blow out the candles on my cake. It’s over twelve months until the next presidential election, and we’re already growing weary of the process—and we can’t blame all of it on Donald Trump, no matter how much we may wish to. I’m tired of reruns, and don’t see the need for another Adams, Roosevelt, Clinton, or Bush in the White House. However, does it really matter? The president has the bully pulpit, from which to claim accomplishments not due solely to the president and make promises, which the president lacks authority to keep. Congress—even with all its gridlock—passes far more laws than anyone needs or can follow. These laws are generally written by lobbyists, who pass them to carious politicians’ staffs. Staff members then brief their bosses; this is actually what the staffer believes the bill means, occasionally based on actually reading the bill, but often just a rehash of the lobbyists’ explanation. This saves our elected officials from actually having to read the bill. The election arrives, and in America, only about 61 percent of those eligible vote exercise the right. The parties’ hardline supporters are about equal; the conservatives almost always vote Republican and the liberals almost always vote Democrat. There are also who vote for the most attractive looking candidate, a name they recognize, or some other silly reason. Let’s ask it another way; who determines that Taylor Swift should be popular? Who determines that NCIS should stay on the air for at least another season? Who determines it’s time to open a convenience store and hire a handful of people? Who determines that we need a new gadget, gizmo, smartphone app? These key decision makers are the ones who are open to ideas, evaluate their merits, and then act. Proponents provide them with data—everything from National Public Radio to Wired magazine to negative campaign ads. Some data these people reject, some they accept as valid, but it does not impact their decision, while some makes its way into their decision-making process. Taylor Swift and Barack Obama owe their position to this group of people. Please excuse Steve from his recent failure to regularly write blogs as he has been suffering from TCD (time and creativity deficiency). This is not a well-known condition because no celebrity has taken ownership, even though it is obvious from today’s movies, television, and music that the entire entertainment industry suffers severely from the same malady. Some physicians and the CDC claim this condition does not exist, along with chronic Lyme disease, Gulf War Syndrome, Chronic Fatigue Syndrome, Post-Traumatic Stress Disorder, and health problems due to Agent Orange, but I assure you that it does. As a lifelong voracious reader, I promise that I will work with Steve to help him start writing more regularly. P.S. I apologize for the fact that I couldn’t physically sign this myself due to the fact that I’m currently deceased.